…to the Cotswold market towns of Stow on the Wold, Moreton in Marsh and Chipping Campden. The attractions of Stratford upon Avon, Warwick, Cheltenham, Oxford and Bath are all within an hour’s drive. The Cotswolds is famous for its beautiful little villages and towns, all built from the honey coloured Cotswold stone, this is the England of the picture post cards. You won’t find large cities or large shopping centres in the Cotswolds, just small market towns and pretty little villages. 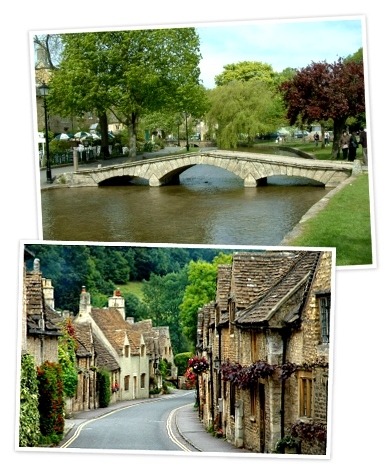 The Cotswolds is a lovely area for walking, cycling, horse-riding, golfing or fishing. All these activities can be found within a few miles of Whiteshoots Cottage. It takes about 15 minutes to walk into the centre of Bourton on the Water. It is a pleasant gentle walk beside the River Windrush. We can provide torches (flashlights) if you plan to return after dark. You can relax on the patio at the back of the house or you can sit at the front of the house and admire the view over the fields to Bourton on the Water. The Cotswolds is a lovely area in any season. Winter is an ideal time for walking in the Cotswolds, the air is fresh, the ground is firm and the views are stunning. If you have a wifi enabled laptop you can use our broadband internet connection through our wireless access point.